One TD pointed out that “We need 1 staff member per 4 patients but instead we’ve got 1 per 8 during the day and 1 per 12 during the night”. 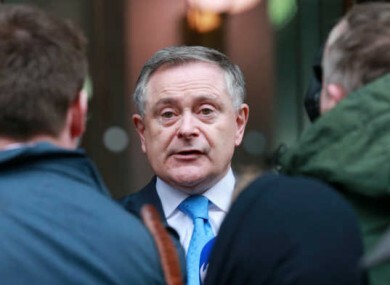 THE MINISTER FOR Public Expenditure and Reform, Brendan Howlin, was today asked about what the government is doing about the housing problem, cutbacks in the public sector and the problems facing low paid workers. Deputy Clare Daly said that state property is needed for social housing, she argued that we should have some sort of task force who assess what state owned properties would be suitable for housing. Brendan Howlin replied that most of the vacant properties are recently closed garda stations. However he did add that one state property in Dublin iS now being used to combat homelessness in the city. He said that a range of issues needed to be taken into consideration such as the suitability, location and condition of the properties and the need for refurbishment. Howlin replied that there’s 440 properties deemed suitable and that the Minister for housing is taking care of that. We’re seeing housing pricing and rent prices going up but no increase in wages. Wallace continued that “Somebody has to take stock of all state owned property”. Howlin said that “I agree with the deputy and it’s an issue we have to address”, he also that that the supply issue needs to be tackled. TD Richard Boyd Barrett said that there is chronic staff shortages in the public sector adding that “we have to talk about lifting the public sector recruitment embargo”. Howlin replied that there’s no embargo and that special provisions have been made for additional teachers and care workers. He said, “The government recognises the areas of most need and responds as such”. He said that the government are working towards a better platform for public service delivery and that shared services and better use of technology are the building blocks for better services. We need 1 staff member per 4 patients but instead we’ve got 1 per 8 during the day and 1 per 12 during the night. “People are also being told that they can’t have grab rails for a year or more. They need them to just to get up the stairs to have a bath”. We constantly hear that these cuts are being made because we don’t have money yet the government had the money to hire three PR advisors at the start of the year. Brendan Howlin replied that “The whole focus is to balance the books and he said Barrett wanted no cuts but also wanted no taxes, adding: “It’s a wonderful fairy land you live in”. Howling said that “287,000 public service staff are working hard to bring services”. He said that the government was making rational decisions but that “The whole focus is to be more efficient and provide front line services so people can have a good experience”. Sinn Féin deputy leader Mary Lou McDonald said that “Low paid public and civil servants are telling me that they would be better off staying at home rather than working”. She said that the increase in tax to people in low paid work is unfair. Howlin replied that “Only people on over 65,000 were taxed extra while others were asked to work extra hours”. Mary Lou McDonald also asked about the financing for stimulus projects. Howlin said the investment project is to fund a range of projects and that the money will come from the exchequer through the sale of state assets. The Sinn Féin TD asked what percentage of funding for the project will come from the sale of state assets. Howlin said that all of that 200 million needed for the 66 large projects is from the sale state assets. Email “Brendan Howlin grilled on the housing crisis and cuts to public services”. Feedback on “Brendan Howlin grilled on the housing crisis and cuts to public services”.